In most of cases, communications based on multimedia form is inaccessible to the visually impaired. Thus, persons lacking eyesight are eager for a method that can provide them with access to progress in technology. We consider that the main important key for inclusive education is to real-timely provide materials which a teacher shows in a lesson. 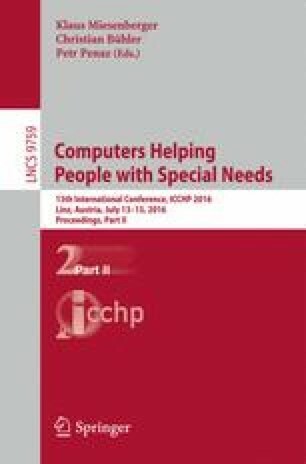 In this study, we present tactile sense and kinesthetic sense assisting system in order to provide figure or graphical information without an any assistant. This system gives us more effective teaching under inclusive education system. This research was supported in both part by the Ministry of Education, Science, Sports and Culture, Grant-in-Aid for Scientific Research (C) 15K04540, 2015, (C) 15K01015, 2015, (B) 26285210, 2015, and Tsukuba University of Technology competitive research grants.